Dutch: single or dual population? A recent study deals with the autosomal structure (or lack of it) of the population of the Netherlands. They studied the autosomal DNA of almost 1000 anonymous male donors from the Netherlands. Interestingly the lowest cross-validation value was at K=1, what indicates that the Dutch (Frisians included) are a very homogeneous population, that the most accurate result of their splitting into several components produced only one such component. 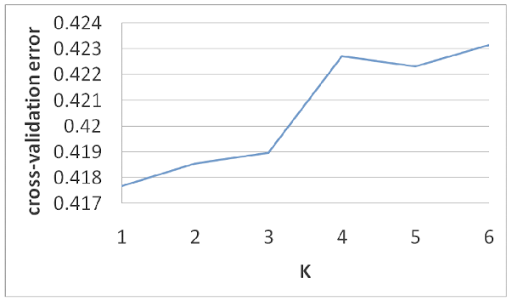 K=2 and K=3 however produce similarly low scores, however the researchers preferred to study K=5, which makes a shallow valley between its neighboring values. Probably not the best idea but nevertheless the overall result is similar to what they get at K=3. K=2 is very intriguing because only a few scattered individuals fall totally (just two) or partly within the second cluster. These individuals persist in their distinctiveness through the whole series. I wonder if they are people with non-European ancestry (no way to know because they are anonymous donors and as far as I could discern ancestry information was not requested from them). Figure 4 Admixture analysis of the Dutch samples. 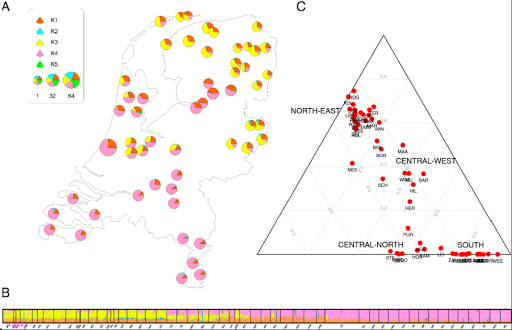 A) Pie chart map of the genome-wide ancestry assignment in the 54 Dutch subpopulations estimated with 10 independent runs by ADMIXTURE  using K = 5 assumed parental populations. B) Individual ancestry estimated by ADMIXTURE using K = 5. C) Ternary plot of subpopulations using the three. Southern area (dominated by the pink component): including Zeeland, North Brabant, Limburg, South Holland, much of North Holland and, counterintuively, Western Overjissel. 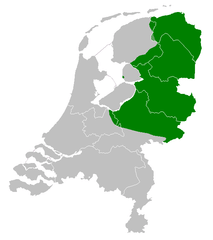 Northern area (dominated by the yellow component): including Friesland, Gröningen, Drenthe and the eastern areas of Gelderland and Overjissel. Transitional area: Utrecht and parts of Gelderland and North Holland. The authors go to great lengths to try to explain this structure but they do not seem to reach any strong conclusion. I’m not any expert in Dutch history but a tentative explanation may be that, roughly, the yellow-dominated areas correspond more strongly to the areas of Low German/Frisian presence and/or some of their prehistoric precursors (often prehistoric cultures of Low Germany tended to be distinct to those further South). 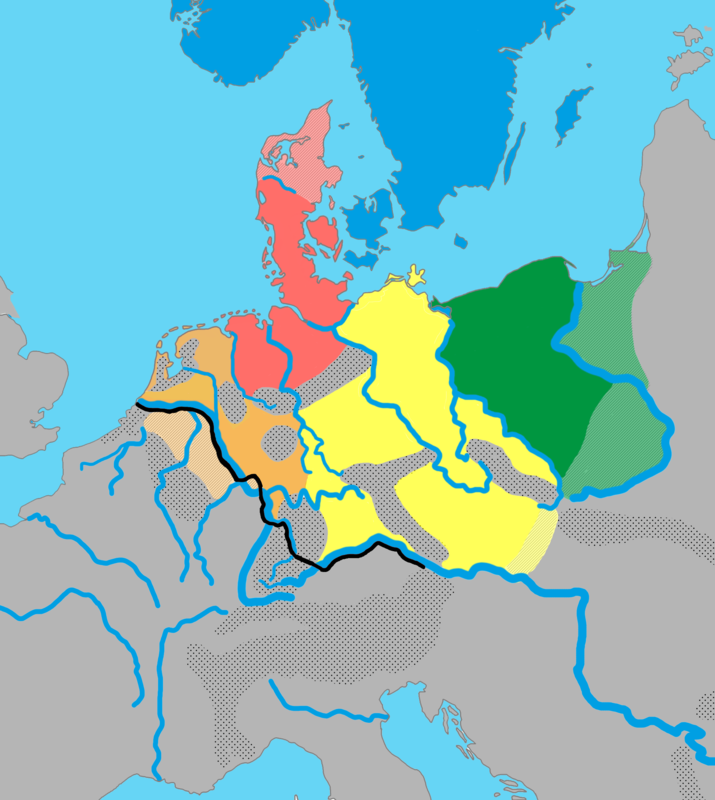 While Dutch and the related Limburgish dialect are part of the wider Low Franconian category (descending from Frankish Germanic and historically spoken around the Rhine), most of the yellow-dominated regions belong to distinct historical language areas: Frisian and Low German, which are both believed to derive (together with English) from the same ancestral Ingaevonic branch of West Germanic. This historical and prehistorical duality may well explain the modern genetic duality in its fundamentals, if not the genetic boundary in detail. Your take in any case.